As I blog this one, I’m feeling bloated and cross from another dinner of turkey and mashed potatoes leftovers. While I’ve been working hard to keep up with exercise this week (which hasn’t been easy), I have most definitely been eating and drinking more and look forward to the post holiday slow down so I can get back to my routine. For a few years now, I’ve been making more of a lifestyle change than one New Years Resolution but you have to start somewhere, right? Here are some good products and sites I’ve tested out over the years that I think most definitely help with not only helping you in a healthy and fit 2014 but are things that will keep for longer than the first few weeks of the New Year. 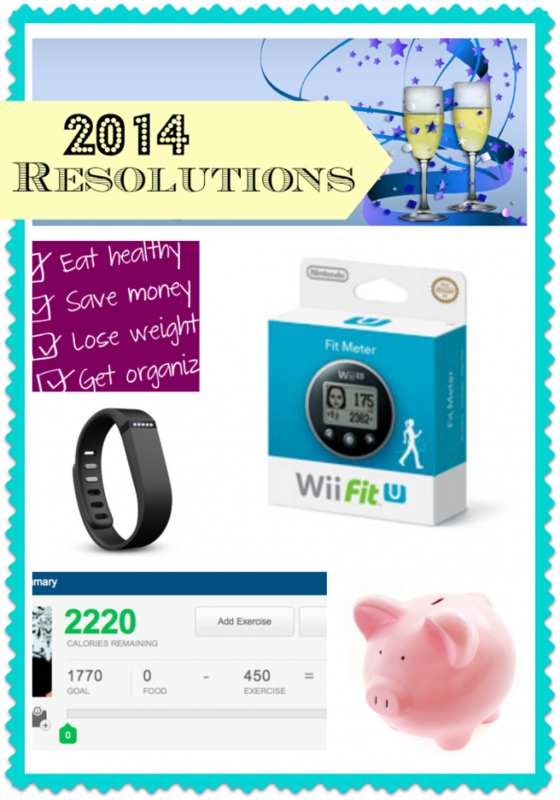 Wii U Fit Meter, $19.99 – got a Wii U? 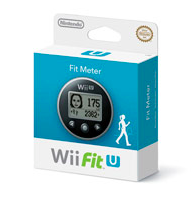 Nintendo has come out with the Wii U Fit Meter. 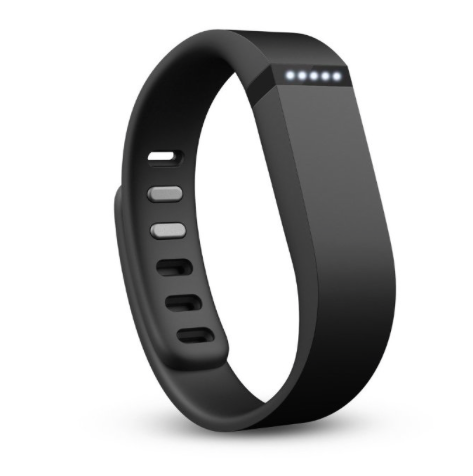 Use it with a Wii Fit Board and sync it up daily to keep track of your steps, calories burned and more. And you can’t beat the price! My Fitness Pal, FREE – year after year I talk about this site but I just love it. In case you haven’t checked it out yet, it’s a free calorie-weight-food tracker and I have been using it religiously for almost 4 years now. I have 4 years of my weight and exercise programmed in and while I don’t use it to calorie count anymore, it’s great when you are starting out on a diet if you do want to calorie count and keep track of your food. I love it for long-term because I’ve kept up with it: I put my weight in every week and it keeps me responsible and in-check. I use it on MyFitnessPal.com and the FREE My Fitness Pal app. Fit Bit Flex Wireless Activity + Sleep, $95 – pricier but this one is all encompassing and Fit Bit has a great reputation. I love the look of this product too – it’s very unassuming on your wrist as it tracks your daily movement/steps, tracks your sleep, has a built-in alarm that will wake you and not your partner up because it vibrates (so awesome) and has LED lights that light up to let you know throughout the day how you are doing. It’s $10/month for a 3 month plan (less if you commit to more months) and you can use coupon code 15%off for 15% off your order! Exercise when you can’t make it to the gym: When all else fails, what’s on your TV? Check out what free videos are available to you based on your service provider. Sometimes I just can’t make it to the gym. We have Verizon FIOS and I love the OnDemand selection of exercise videos. They change month to month but I have one particular line of videos that seem to stick around that I love (MartialFusion.com, kickboxing) that are free videos that I can do from the comfort of my house in 42 minutes. Follow my Fitness Board on Pinterest to get some other ideas I love (like the water/cucumber/mint drink – totally doing that!) and let me know what you’re doing to start out the New Year Healthy! Finances – I saw somewhere on the news that more people this year will have financial resolutions than health and fitness ones. That shocked me a bit but seems responsible! I went to a great day out at Vanguard in 2013 and I got some awesome feedback on Saving for College and some Quick & Easy Investment Tips. I’m wearing my Wii U Fit Pedometer as I type! ðŸ˜‰ It seriously helps me realize how inactive I can be on days. I am trying to get in 10K steps a day. Wow that is awesome Jamie!! Does getting 10k steps in involve working out or can you get to that without working out? Just curious!